This illustrates a patient with psoriasis accompanied by arthritis and other joint problems. 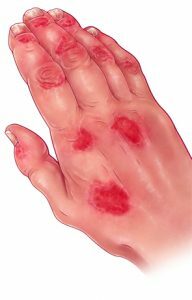 Aside from the appearance of red skin lesions and joint inflammation, changes in fingernails and dactylitis (swelling of fingers that create a sausage-like appearance) are characteristic of psoriatic arthritis. “The new list of treatment recommendations provides a way for clinicians to keep up with the literature in a field that rapidly evolves,” says Arthur Kavanaugh, MD, a coauthor of the recommendations, and professor of medicine in the Division of Rheumatology, Allergy and Immunology at the University of California–San Diego, La Jolla, Calif. “The recommendations also reflect a growing appreciation of other aspects of the disease, such as the importance of comorbidities, which previous recommendations did not address,” he adds. Along with including the importance and treatment of comorbidities associated with PsA, the new recommendations include three new classes of drugs that have come to the market since the 2009 recommendations. These include inter­leukin 12- and 23-blocking drugs, an interleukin 17-blocking drug and a small-molecule drug that inhibits phos­­pho­diesterase 4. 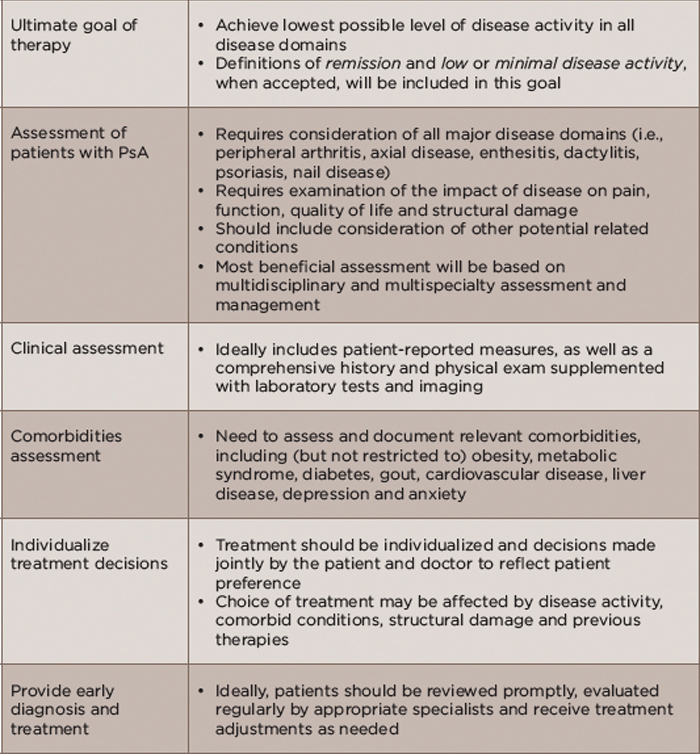 The 2015 updated recommendations were developed by a panel of GRAPPA rheumatologists, dermatologists and patients with PsA, which reviewed the current literature on treatment of key domains of PsA, including arthritis, spondylitis, enthesitis, dactylitis, skin disease and nail disease. 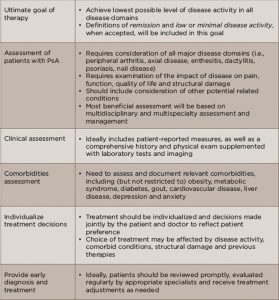 New to this update was the inclusion of a review to identify pertinent comorbidities associated with PsA and their effect on treatment. Source: Adapted from Table 1, References 1 and 3.